This piece of Greek mythology is a tale of a man attempting to reach the heights of the heavens, but not realizing his limitation. It is also a cautionary tale about pride. Daedalus, Icarus’ father , constructed wings out of wax and feathers so that they could escape the island of Crete. I could only imagine the possibility of individual flight. I would have been ecstatic at the opportunity. The tragedy of the story is that Icarus, filled with hubris, neglected his father’s words not to fly too close to the sun. 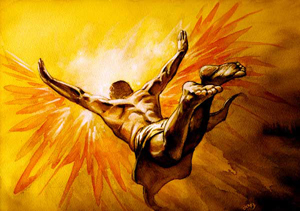 The story ultimately ends with Icarus’ wings melting and him falling from the sky into the sea and drowning to death. Of course sadness grips Daedalus because he has lost his son. If you’re like me, although you’ve heard the story repeatedly you still hold out hope that somehow the conclusion of the tale is not the same. Although the story of Icarus is mythology, it does reveal an ongoing human dilemma. I can’t help but observe that hubris is his downfall. It seems that the Icarus story is replicated in Western culture in the lives of the young and old. The story of Icarus is a lens through which we can view America’s cultural and historical weakness. Are there real consequences for pride? Western culture is defined by a strong individualism. The culture is largely characterized by narcissistic goals. As a country we instinctively believe on the world stage that we are beyond accountability and correction. This kind of philosophy permeates almost every corner of society. A quick glance at an award show and you will be hard pressed to find a soul who considers others more than themselves. The virtue of humility has been replaced by a “just do you” mentality at almost every level. We push the upcoming generation to make money, get famous as quick as you can or die trying. The streets are littered with kids turned adults chasing after unrealistic dreams of grandeur without putting in the hard work of humility. In the urban community we critique the violence of the streets and the disrespect of some artists but neglect to challenge a culture that’s focused on materialism and status through notoriety. As a culture, I believe we fail to see the connection between chaos and being self centered. In most urban communities, our role models are athletes and musicians or anyone with a public persona. Many of the bulwarks of the community are ignored. Jesus Christ adorned Himself in flesh and for a short time veiled His glory. He displayed His power to affirm His message of hope. He inaugurates His public ministry by going into a synagogue one day and reading from the scroll of the book of Isaiah in the place where it says, “The Spirit of the Lord is on me, because he has anointed me to proclaim good news to the poor. He has sent me to proclaim freedom for the prisoners and recovery of sight for the blind, to set the oppressed free, to proclaim the year of the Lord’s favor.” Luke then tells us what Jesus did after reading, “Then he rolled up the scroll, gave it back to the attendant and sat down. The eyes of everyone in the synagogue were fastened on him. He began by saying to them, “Today this scripture is fulfilled in your hearing.” Here Jesus describes what He would be doing. This is hardly a, “What I want to do when I grow up” list. There is no wealth or notoriety–just serving others—a very ‘other centered’ lifestyle. Jesus’ mission runs counter to our culture. 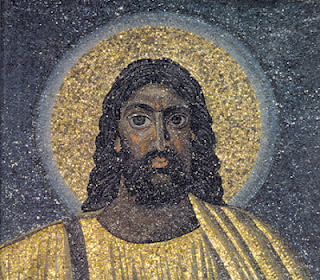 In fact, the incarnation itself is counter cultural. Think about it—The Son of God intended to be born into poverty under oppression. Often times we attempt to sanitize the Biblical narrative by systematizing and dismissing anything that seems secondary to predetermined categories. I’ve chosen to no longer ignore the place and times of His birth and life. (Matthew 8:20) He selected those He would dwell among. (Mark 2:16) He chose to dwell with those in need versus those with privilege. (Luke 5:31) The church represents, or should represent, the incarnational theme found throughout scripture. Too often the church favors power and authority rather than sacrifice and reaching the ‘least of these’. It is not by coincidence that Christ entered the world through an “at risk” community. Christ condescends or goes down to earth in order to redeem humanity. His actions provide a direct contrast to the path of Icarus. Too often we burn out early and crash because we lose sight of the dangers of hubris. We set ourselves up to think that we can do anything we desire without the consequences associated with pride. I would hope that we would consider the path of humility as Christ and His Apostles displayed throughout the New Testament. The reversal of social order is described by Christ in His future Kingdom reign. He says, “But many who are first will be last, and the last first.” (Matthew 19:1) This may not lead to an award shows appearance, but it will lead to blessings in this life and beyond. You’ll never get burned if you move towards the Son. The environment of Jesus’ birth and early life is an intentional identification with those who are disenfranchised and outside of the power structure of society. (Heb. 2:11, 14) As we saw earlier His pronouncement in Luke 4 reveal a direct alignment with those who were powerless and not those who were beholden to Rome or the religious elites. He identifies with those who served and not those who were served. (Phil. 2:6-7) His teachings in Luke 6:20-26 is a direct warning to those in the upper class of social order—the difference is those to whom He He directs blessings and those He warns.